AUBURN – It was a hot and humid Saturday on The Plains for the annual matchup between LSU and Auburn, but in the end, it was the Tigers in white who pulled off the road upset, 22-21, thanks to a field goal from Cole Tracy as time expired. Auburn’s offense struggled early, starting with an interception from quarterback Jarrett Stidham on the second snap of the game. LSU took advantage of the early turnover with a 1-yard touchdown run from Clyde Edwards-Helaire that put the Bengal Tigers up 7-0 just five minutes in. The Auburn defense picked up the slack for most of the first half as the Tigers continued to struggle on the offensive side. At the end of the first quarter, Auburn had just 71 yards of offense compared to LSU’s 123. Tracy made it 10-0 LSU after knocking through a 33-yard field goal about midway through the second quarter. Down early, Auburn’s offense put together a strong, 10-play drive that ended with a 7-yard touchdown from JaTarvious Whitlow. The Tigers claimed the lead 14-10 on their next possession with a 7-yard touchdown run from Shaun Shivers that capped off a nine-play drive with just 1:31 left to play in the half. After an abysmal start to the first quarter, Auburn found itself carrying a 14-10 lead into the locker room at the break. Auburn more than doubled its offensive production in the second quarter, finishing the opening half with 179 total yards, just behind LSU with 191. Auburn scored quickly to start the second half when Stidham connected with Darius Slayton for a 4-yard touchdown that put the Tigers up 21-10. Tracy cut into that lead later in the third quarter with a 27-yard field goal that made it 21-13 Auburn. 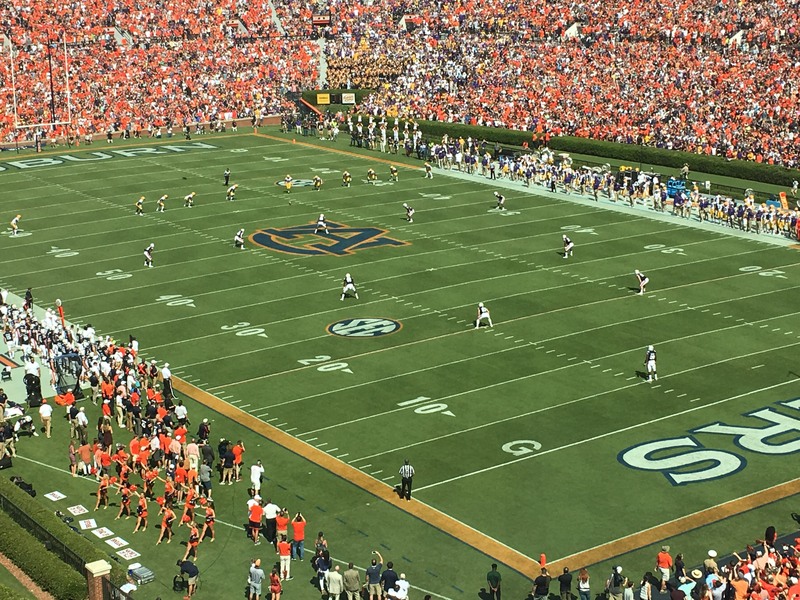 Auburn’s offense began to move the ball downfield on its next possession, but after crossing midfield, Stidham was intercepted a second time, stalling the Tigers’ drive. The Auburn defense continued to hold strong and kept the lead at eight points until LSU quarterback Joe Burrow found Derrick Dillon over the middle for a 71-yard touchdown that made it 21-19 early in the fourth quarter. LSU went for two points to tie the game, but Burrow’s pass was broken up by Jamel Dean in the back of the end zone. Auburn’s offense was forced to punt on its next possession, giving LSU the ball on it own 24-yard line with just under six minutes remaining and needing a field goal to take the lead. Auburn’s defense forced Burrow backwards on a third-down play at midfield with just under three minutes to play, but LSU was able to convert on fourth down and keep its drive alive. Auburn was called for pass interference again on the ensuing play, setting LSU up with a first down at the Auburn 24-yard line with 1:14 to play. LSU allowed the clock to run down to two seconds before sending Tracy out to attempt the game-winner from 42 yards out. Tracy’s kick was good, and LSU was able to pull off the upset on the road at Jordan-Hare. Whitlow led the way for Auburn’s offense throughout the day, posting 112 yards and a touchdown on 22 carries. Three different players had at least 10 carries for LSU, but Nick Brosette was the primary tailback, picking up 73 yards on 19 carries. LSU out-paced Auburn in most categories, including turnovers, third downs, total yardage and time of possession. Auburn will have to regroup this week and try to get back in the win column when the Arkansas Razorbacks visit next Saturday.